GlassWorks has the talent and experience to get any of your glass shower enclosures and glass shower door enclosures needs finished fast! That’s one of the reasons why GlassWorks is notorious as the premier company for the most first-rate shower enclosures and glass shower stalls that our customers come by. Furthermore, GlassWorks has been acknowledged as the glass company that provides only the best installation experts of architectural glass throughout the Greater Chicago Metropolitan Area! Ever since 1997, GlassWorks is glad to take pride in their marvelous glass shower enclosures and glass shower stalls. So, whatever style of glass shower enclosure you wanted, GlassWorks has precisely what you want! We’ve been supplying the most astonishing and award-winning services to the residents of Northbrook because of our widespread collection of glass shower enclosures and glass shower stalls. Besides, we have been serving on average 4,000 customers yearly and we can’t wait to serve you! Northbrook, Illinois is a village that has just over 33,000 residents and is located on Chicago’s North Shore at the northern edge of Cook County. Glenview is the home of GlassWorks and it is located only 5 minutes from Northbrook, which makes it an easy drive for the greatest glass shower door enclosures that you can find! The citizens of Northbrook are very thankful that we have fashionable shower enclosure designs that they can choose from. 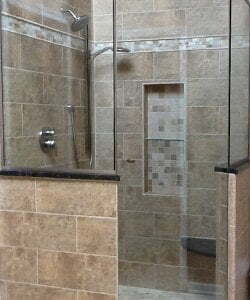 Therefore, the Northbrook residents understand that GlassWorks can shape any glass shower stall or shower enclosure to fit within your bathroom desires. Our shower glass is identified to be “safety glass” that can ensure our bathers that they are fully sheltered within their reinforced shower glass structure. Besides, your new glass shower enclosure or glass shower stall will turn your bathroom into a relaxing atmosphere. Likewise, our faithful clients are continually comfortable while working with GlassWorks because we can offer them the most worthwhile and low-cost products that can fit within their budgets. Starting from our frameless glass shower doors to neo-angle glass shower doors, glass steam shower enclosures, framed glass shower doors and custom glass shower doors, GlassWorks can work very proficiently and skillfully to get any shower enclosure job finalized. So, whichever glass shower stalls and shower enclosures you pick, GlassWorks’ installation technicians can get it done! The GlassWorks employees are ready to help, so call us at: (847) 729-5580 to receive a FREE ESTIMATE! Or for an appointment, complete our online form for a 10% reduction!